The number of the beast mentioned in the Bible's final book of Revelation is a topic full of symbolism and speculation. It has been seemingly approached from every different angle in an attempt to seize upon the individual who it is said to reference, and the means by which it shall be implemented. Authors competent and less so have offered myriads of answers supposing to be the final word on the topic. This short study is not intended to add to that sea of confusion. Rather, a simple observance is here shared in hopes that the reader can appreciate that the wiles of the Enemy have been at work from the beginning of things to leave his mark upon all of humanity. None of us are immune to the scars left by the serpent, and in admitting that mark common to all is encountered by man in so many ways throughout life, let us return to the initial meeting between the beast and the best of us: the encounter in the Garden of Eden. The heart of this simple presentation lay in the fact that the number viewed as so arcane and ominous is found in a unique fashion in the first book of Scripture. From Genesis 3:1 to the end of 3:13, there are EXACTLY six hundred and sixty-six (666) letters in the Hebrew text. 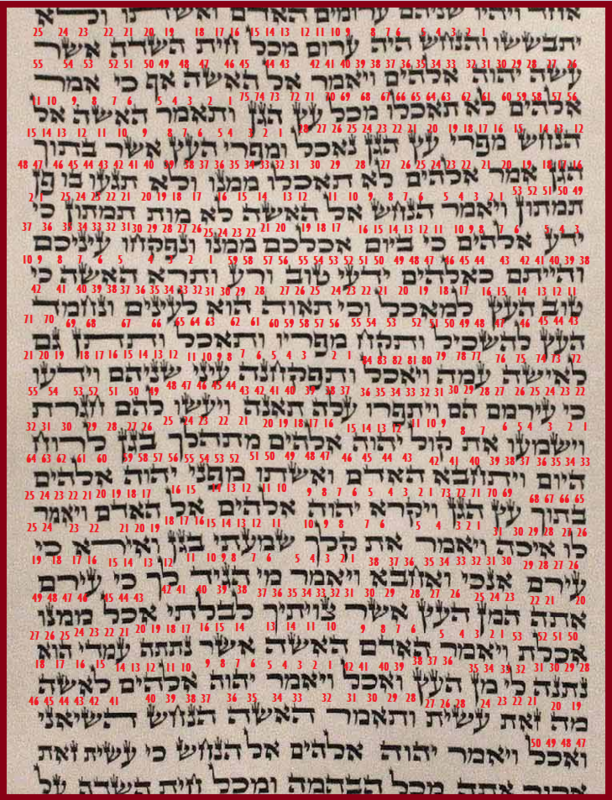 The image from a Torah scroll of those verses has been included, showing the number of letters appearing in each verse, which arrives at a sum of six hundred and sixty-six. What happens in 3:1? The serpent is first introduced, and he and Adam's custom-made bride discuss the merits of the Tree of the Knowledge of Good and Evil, which leads to mankind's original rebellion, and her explanation to the Creator of what happened, at the end of 3:13 -- HANAKHASH HISHI’ANI VA’OKEYL -- "The serpent deceived me, and I ate." With this word, she repeats the exact same reply as her husband in the verse prior: not only did she eat, but with the Hebrew verb tense in the imperfect, she is saying that she will, given the opportunity, eat of it again. As horrific of a crime as eating of it was, humanity boldly asserted in the Presence of the Holy One that they would continue in that rebellion of following the beast rather than obeying the Creator. Revealed in these words is the spiritual essence of taking the number of the beast: allegiance to his guidance over that of our Maker.